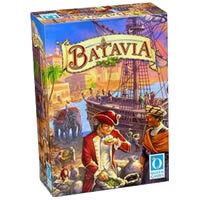 While playing the board game Batavia, you will take on the role of a merchant visiting trading posts throughout Asia. Batavia players are seeking passage on the company's ship which requires different commodities that are given at various trading posts. Collect the most commodities in a warehouse and you'll be awarded the most gold coins at the end of the game. Batavia is a strategy board game that is uniquely designed and well themed. Make sure you read through all the Batavia game rules and instructions before you begin. Try playing Batavia with your friends. The Batavia player who manages to travel to the trading posts with the most lucrative commodities and collect the most commodities in a warehouse is awarded gold coins at the end of the game. Batavia has 35 trading posts, 1 target counter, 1 die, 75 promissory notes, 60 commodities, 5 merchant figures, 5 counting pieces, 110 ship cards, 1 ship, 1 cannon, 5 ship cubes, 5 company seals, and the Batavia board game rules and instructions. Please keep in mind that the official Batavia board game rules and instructions could be different depending on the game version you have. The rules below are some of the exact directions on how to play Batavia. Share with us your comments, funny stories, tips, advice, strategies, creative ways to play, questions about how to play, problems with the rules or anything you want about Batavia. All submissions will be reviewed within 24 hours. Click here to add your Batavia comments.